Physics in Perspective seeks to bridge the gulf between physicists and non-physicists through historical and philosophical studies that typically display the unpredictable as well as the cross-disciplinary interplay of observation, experiment, and theory that has occurred over extended periods of time in academic, governmental, and industrial settings and in allied disciplines such as astrophysics, chemical physics, and geophysics. 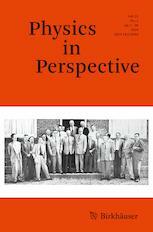 The journal also publishes first-person accounts by physicists of significant contributions they have made, biographical articles, book reviews, and guided tours of historical sites in cities throughout the world. It strives to make all articles understandable to a broad spectrum of readers – scientists, teachers, students, and the public at large.